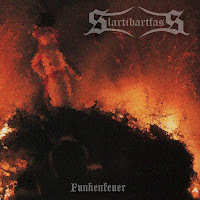 Slartibartfass is another in the endless stream of bands who choose to incorporate heathen/folk elements into their music, but they do it quite well. Funkenfeuer is their third album, and most accomplished to date, largely due to their excellent use of bagpipes and synth/intro pieces. The first two tracks here are both excellent instrumentals, which captivate the imagination and atavistic genes within the listener (provided you have said European genes). "Schleier der Vergangenheit" has the sounds of horns and pipes cutting through the rain dark backdrop, along with the cawing of birds. "Ein Ruf aus fernen Zeiten" emits some shining, beautiful synth-work, kind of like old Vangelis meets delightful folk, and the track grows pretty intense. 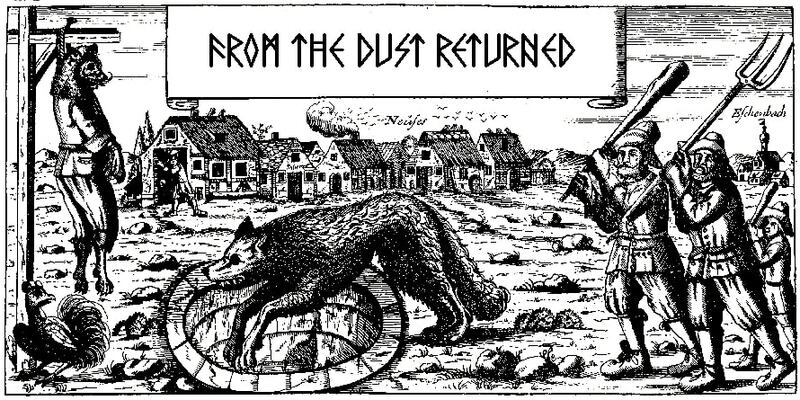 At this point, I wanted the album to remain a wonderful instrumental work, but "Der letzte Winter" introduces the ol' folk metal charge, and the German snarling. Though it tries hard to work up a fervor of epic combat, the riffs just aren't that interesting, and you long for more of the band's bagpipes and Jewish harps. It's not all a waste, "Schwabenkinder" has some strong moments, and the closing track "Stimme des Windes" is both vibrant and powerful, with the pipes shining through and the keyboards providing a suitably epic landscape. The production values of the record are certainly not at fault for any of its lapses into mediocrity: the keys and pipes sparkle and swell, and the guitars and drums are very well mixed. The band can rival any peer when it comes to the incorporation of its folk half, but sadly the metal just does not live up to it, as is the case with so many of these types of records. Overall, this is still a fine record, but I think the band could be capable of more.